As a busy Mom of two preschoolers, my time is limited for getting ready every morning. Let's face it, it is a total rush for me to get myself ready and two kids ready and fed and out the door to preschool. I honestly don't have time to fuss about with my makeup. Sure, I am a beauty blogger and LOVE makeup. However, most days, I really have to work quickly to get my makeup on and get ready. So, I always appreciate products and kits that are geared towards getting me ready quickly and effortlessly! So, when I heard about Charlotte Tilbury's Quick N Easy Makeup Kits, I just had to give them a try! These are such cute kits! These kits were designed to get you ready quickly: mirror-less makeup items, finger-smudge friendly products, and multi-tasking makeup. We could all use some extra time in our day, right? There is no need to spend a ton of time on your makeup to get a great look! 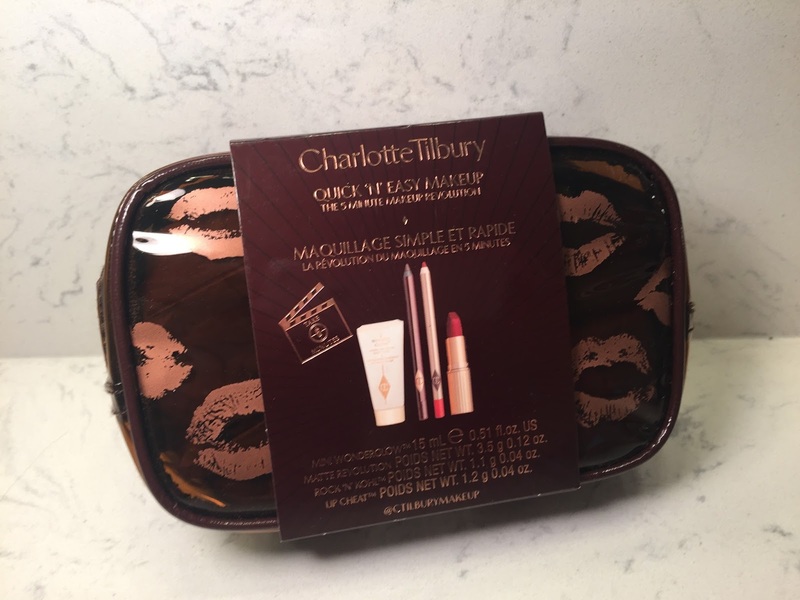 You can easily get a fantastic look quickly with these Charlotte Tilbury kits! 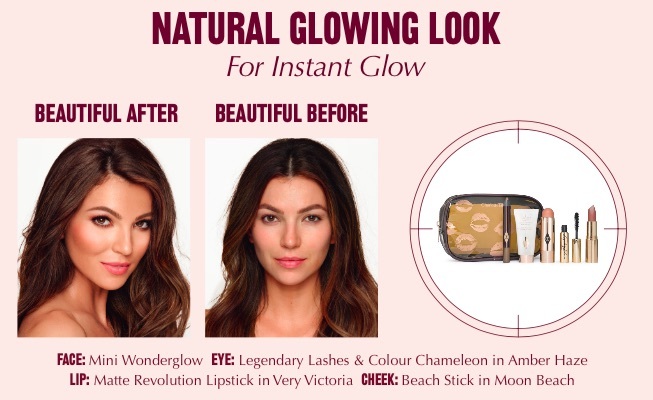 Wonderglow: Contains flourescent core that soft-focuses and redirects the light to more flattering angles of your face. Colour Chameleons: Contains sapphire extract to morph your eye color sparkle. Legendary Lashes: Contains tamanu oil to nourish and sculpt the lasehs, easily buildt throughout the day. Beach Sticks: Contains ceramidone that smoothes like polyfiller over open pores. Kissing Lipstick: Tree extract nourishes, plumps, and glides overa any skin textures at every age. I am so excited that I got to try out the Red Carpet Party Look Kit. It contains everything I need to get super glam in just minutes. Plus, I love the cute makeup case, too. I like how each kit has a totally different assortment of products! So, you can really collect all the kits to have a total variety of items to really change up your look. 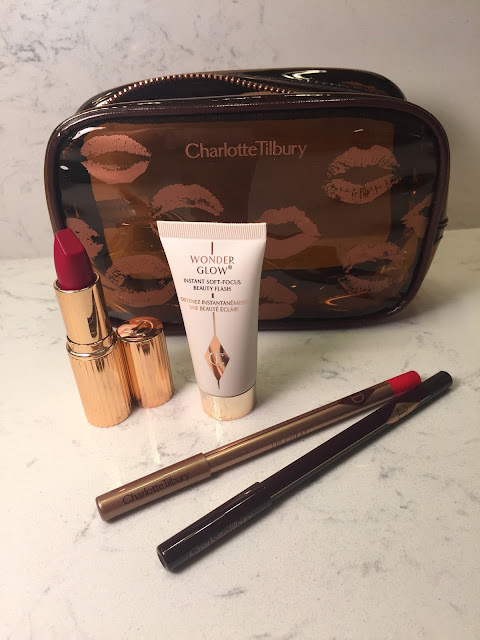 As I mentioned, this is the kit that I got to try and I absolutely love it! I'll admit, I am not normally one to go for a "glam" makeup look. I tend to steer more towards natural makeup looks. With that said, I do love to experiment sometimes. A glam makeup look can be intimidating. 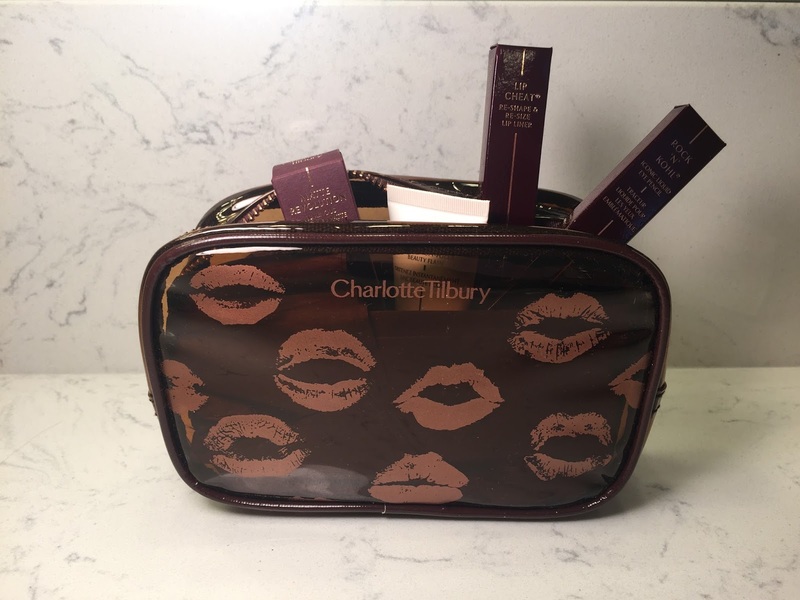 However, this kit takes all the guesswork out of creating a glam look! 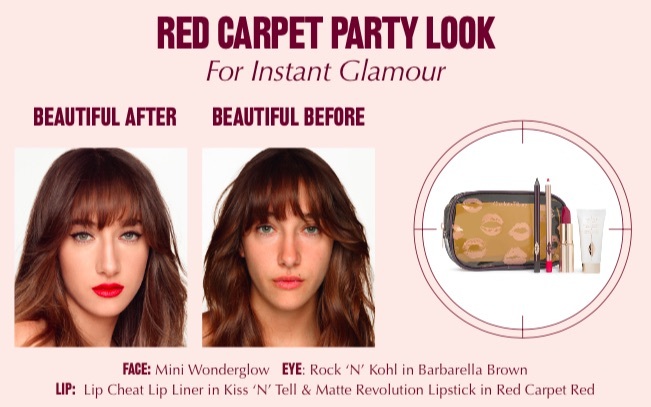 The Red Carpet Party Look kit makes getting glam easy! Plus, I have found some new products that I really just love. 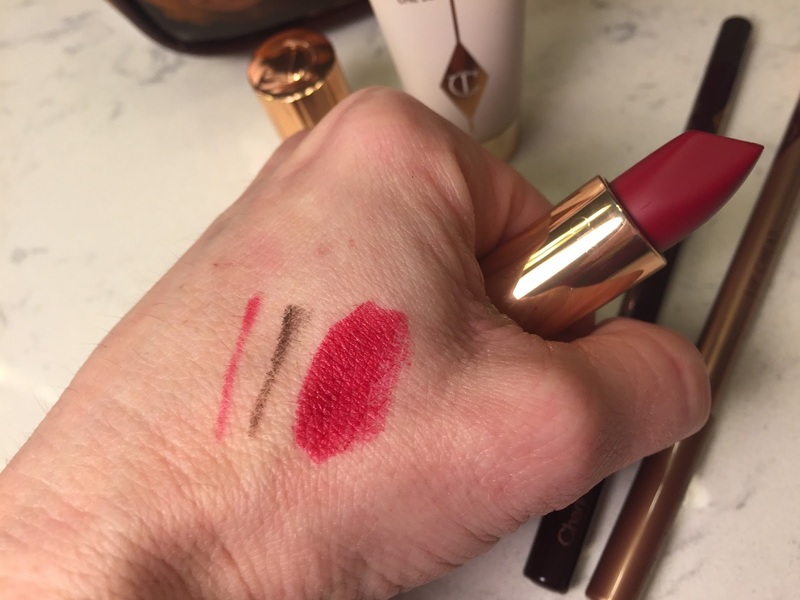 The Matte Revolution Luminous Modern-Matte Long Lasting Lipstick is amazing! It is so smooth and pigmented. Plus, it is just the perfect red. There is nothing like red lipstick to make you feel instantly glamorous and made up! The coordinating Lip Cheat Lipliner works perfectly with the lipstick to define my lips and make my lips look bigger. The Rock n Kohl Iconic Liquid Eye Pencil in Barbarella Brown gives my eyes quick and smudgable dimension. This liner is just so smooth and lays down a super rich and dark line. It wears all day for me (and I have watery eyes!). I have a feeling this is my new go-to liner for every day! The Wonderglow primer is fantastic for underneath your foundation for giving you that extra boost of glow. Love, love, love these products! Are you a #QuickNEasy girl? Be sure to tag @ctilburymakeup, so they can see your 5 minute makeup magic masterpieces! 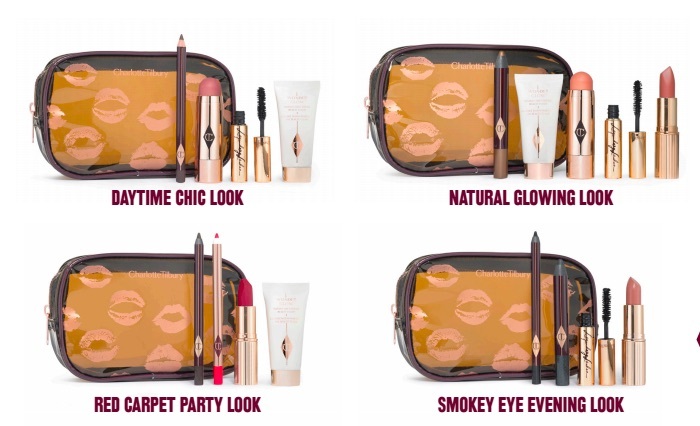 The Quick N Easy kits from Charlotte Tilbury retail for $75 and are available now at Charlotte Tilbury.com, Bergdorf Goodman, BergdorfGoodman.com, Bloomingdales, Bloomingdales.com, Nordstrom, Nordstrom.com, Net-A-Porter.com & BeautyLish.com. Are you a #QuickNEasy girl? 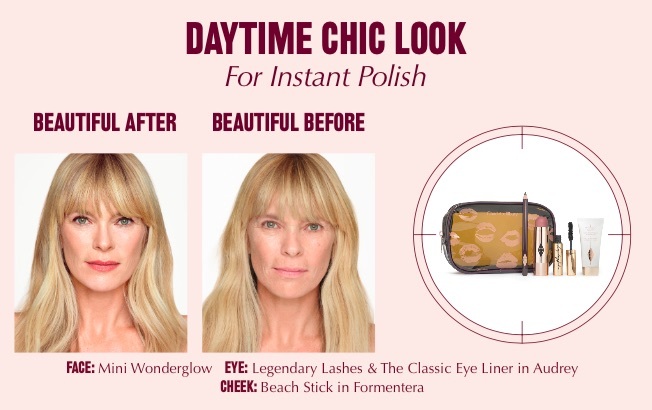 , so I can see your 5 minute makeup magic masterpieces! Whether it’s on the tube, in the car or in the boardroom... tag me to show me!